Why jBPM5.0 does not work on IE while jBPM 5.0 CR1 worked with GCF? I was able to make the web based editor work in IE with version 5.0 CR1 release, but just installed the new 5.0 release, it does not work on IE even with Google Chrome Frame. Does anyone know why? If there is any work around that I can use to make it work in IE? If I cannot make it work in IE, we will have drop to use jBPM. 1. Why jBPM5.0 does not work on IE while jBPM 5.0 CR1 worked with GCF? And what could be the specific reason why it does not work in IE? since IE claims to support HTML5. 2. Why jBPM5.0 does not work on IE while jBPM 5.0 CR1 worked with GCF? The Oryx designer works well currently on Firefox and Chrome. We do aim to support IE wherever possible, but it is not always easy, especially around more advanced features like the web designer canvas which isn't well supported on IE. We will aim to update Oryx for IE compatibility at some point. In the mean time can you please point us at your alternatives that you are considering that provide executable BPMN2 from a 100% web based (non-flash) solution that work in IE? That would help us better understand the various options. 3. Why jBPM5.0 does not work on IE while jBPM 5.0 CR1 worked with GCF? 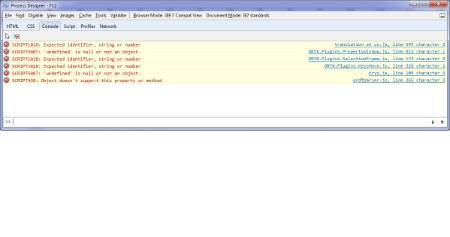 The attached screen is the IE console while I tried to load editor in IE. In Chrome, there is always a Save Failed error message box too. 4. Why jBPM5.0 does not work on IE while jBPM 5.0 CR1 worked with GCF? Are you using the "drools" profile when you get the "Save Failed" errors? What is the console output when you get that message? Regarding the JS errors, would be nice if we can get more info, are the script locations on the right side clickable to show more info? 5. Why jBPM5.0 does not work on IE while jBPM 5.0 CR1 worked with GCF? I used to get this error with IE before I added GCF plugin, but not sure this time, it seems the GCF is not taking place. 6. Why jBPM5.0 does not work on IE while jBPM 5.0 CR1 worked with GCF? 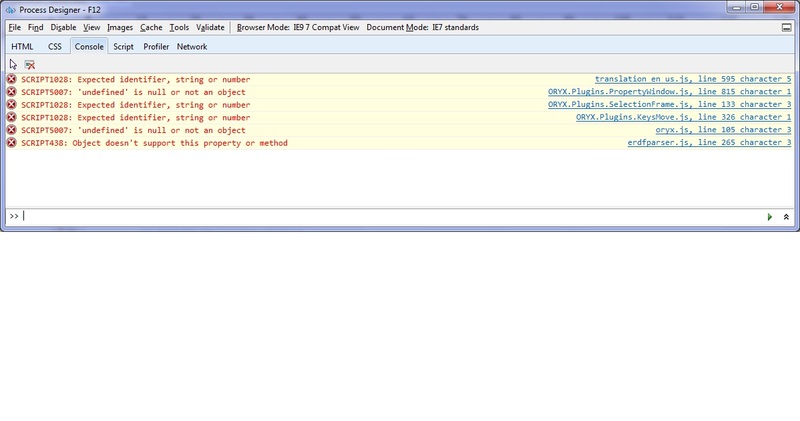 But the new Guvnor is not work as good as before(i.e 5.1.1 and 5.1) in IE. It's no longer base of gwt ? Why? 7. Re: Why jBPM5.0 does not work on IE while jBPM 5.0 CR1 worked with GCF? Its been close to 4 months since the last post on this problem. Are there any current updates on this ? Specially our organization is interested to know about the compatibility of jBPM Console,Guvnor and Oryx with various IE versions. It would be great if you can update us on this.